The Chocolate Design Agency created this video depicting (According to Gizmodo) a phone based off of an e-paper design. I can't find anything else on this concept, but I like it. I've always been a huge fan of the Star Trek Franchise. Now there is a new movie in the works. Not much is out about it yet, but here is a Trailer. The Toyota Prius...Ugly...Not as good as it claims. Okay, so this video is from a BBC show that NBC is looking at creating a US version of. This is really funny. Watch the whole video. The Toyota Prius is not just ugly; it also makes claims it may not live up to. I hope Top Gear does come to the USA. An after thought: the Top Gear site is not the greatest. I couldn't link to the video on their site. I actually couldn't even find it. I hope the video doesn't get removed from YouTube. UPDATE, Video removed. Here's a link to watch it. I've always been a Corvette fan. Since I can remember, driving has been a passion of mine. I love to do it, read about it, and blog about it. And I've always desired one thing: a car made in my country, at a price that is reasonable, that can compete with all those exotic foreign cars marked up to a quarter of a million dollars or more. Hello Corvette. 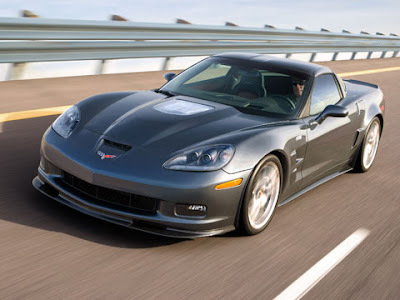 The Corvette group at General Motors' Chevrolet has always been able to reach that exact point; a well built sports car, competing with the likes of Ferrari and Lamborghini, for an "affordable" price. Of course, "affordable" doesn't mean practical, which is why the Vette is still not in everyone's driveway. But here is why I write this blog. The current Z06 Corvette is the greatest Vette ever built. However, the chairman of GM thought, and I'm paraphrasing, "If this is what we can do for $65,800, what can we do for $100,000?" Well, introducing the next Corvette ZR1. Originally, the ZR1 came out as the 1990 C4 Corvette's top model, with all the extras needed to be called "the representative of the state of auto-making art at GM" in that day. Now, the C6 Corvette will wear the name ZR1 to signify its true ability to compete with the best. The newest ZR1, slated for 2009, is said to be pushed around by GM's LS9 6.2L V8 with a supercharger to help produce an estimated 620hp; 100hp per liter. Along with many upgrades from the Z06, the ZR1 has ceramic brakes, improved shocks, stiffer anti-roll bars, and a bevy of other changes. Yes...I'd buy one...if it was practical...or I had an extra 100k or so sitting around. I love this car. Official Picture from Chevrolet's Official Page.